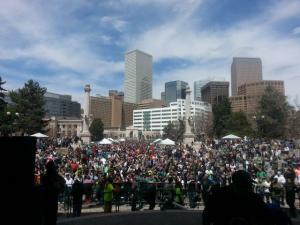 Yesterday's historic "420" rally in Denver , the first since Colorado voted to legalize marijuana last fall, was marred and cut short by violence. Two unidentified gunmen shot and wounded three people -- two attendees were shot in the leg and were rushed to a nearby hospital with "non-life-threatening-injuries," and a teen was grazed by a bullet and walked there, according to the Denver Post . Attendees fled the scene, and the remainder of the event as well a smaller one planned for today were canceled.